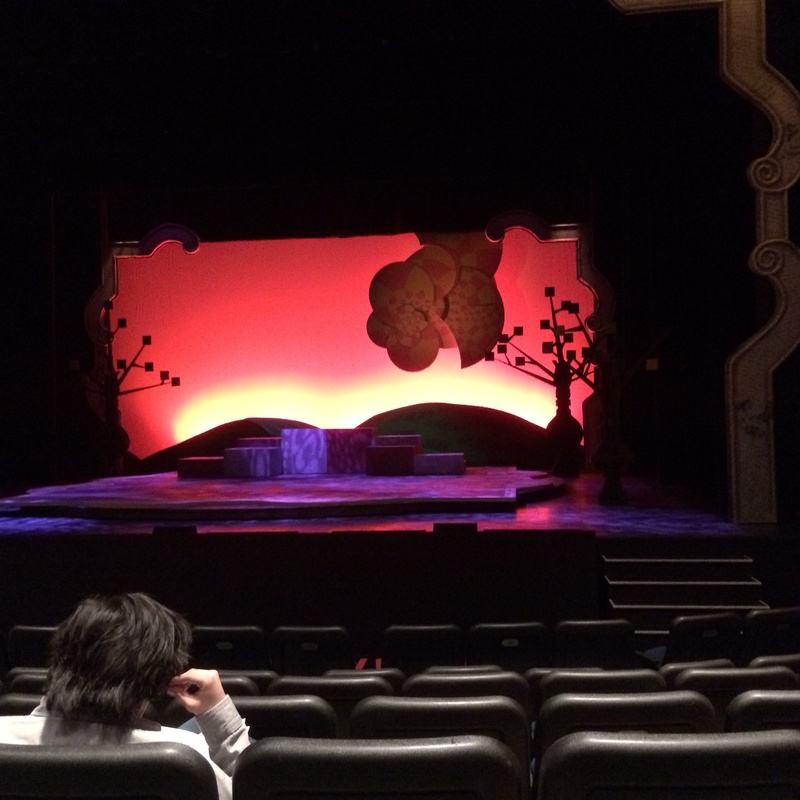 Red Deer College’s William Shakespeare in the Land of the Dead, which played in October of last year, was a performance that didn’t fit tidily into a genre. The title gave a hint of what to expect though – a juxtaposition of Shakespeare and zombies. The play was written in 2008 or so by John Heimbuch, and directed by Kelly Reay of Calgary. The cast of fourteen are all students in the graduating year of the Theatre Performance and Creation program, last seen as an ensemble in Ten Lost Years last spring. The set, constructed in the black-box space of Studio A, created the sense of being in the greenroom or other backstage space at the Globe Theatre shortly after it had been built, with warm yellow lighting and a light mist or haze, rough wooden benches and table, and large exposed beams suspended overhead. The scene opens with Kate (Pharaoh Amnesty), the ” ‘tiring girl” for the Lord Chamberlain’s Men theatre company, starting to clear up the room while a performance is going on. Shakespeare (Evan Macleod) and Burbage (Richie Jackson), friends and collaborators, then enter and discuss past and future productions, the politics of the day, the troubles of dealing with actors and patrons, and so on. Will Kemp (Nate Rehman), the clown of the company who had been known for playing Falstaff, bounces in, pesters Shakespeare to write Falstaff into more scenes, and taunts him that audiences would rather see his jigging and foolishness than a story with a plot. The parts that I knew about seemed consistent with canon, and this part introduced some of the main characters, but I felt like it dragged a little and was sometimes hard to hear or to follow. The rest of the company tumbles backstage at the end of their performance, stripping off tabards for Kate and the company apprentice Rice (Robyn Jeffrey) to collect and fold, and calling for everyone to join them at a tavern. But while Kemp and Shakespeare stay at the theatre, the tavern excursion encounters some zombies and comes back infected. Other characters attempt to shelter in the theatre, unaware of the contamination, most notably Queen Elizabeth I (Emily Cupples) with a small retinue. Cupples, in large starched ruff, was splendidly regal. The production is a wonderful showcase of zombie makeup, because those bitten early in the show show more decay with their every entrance, while those who manage to survive until near the end appear nearly undamaged. As I don’t have my program for this production at my fingertips I can’t tell you who to credit for this design and application. This entry was posted in Uncategorized and tagged brock beal, emily cupples, emily seymour, erin pettifor, evan macleod, kassidee campbell, katie walker, kelly reay, michael moore, nathan rehman, pharaoh amnesty, pharaoh seeley, red deer college, richie jackson, rina pelletier, robyn jeffrey, shakespeare, warren stephens, zombies on February 8, 2015 by Ephemeral Pleasures.